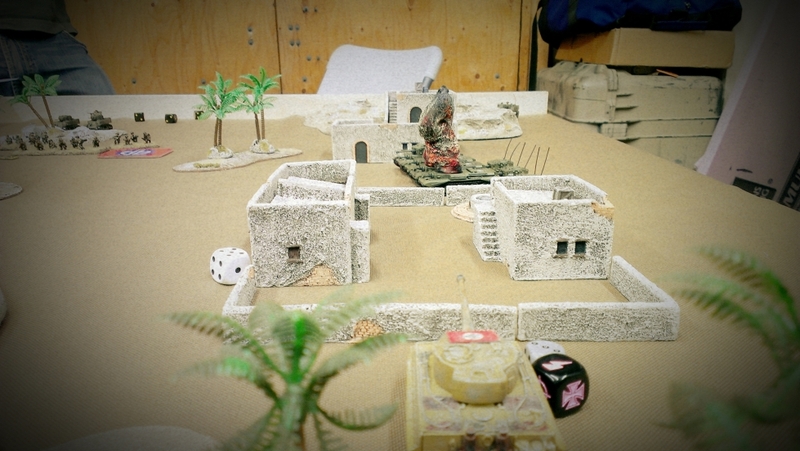 For this past Friday Night Fights, we broke out the desert terrain and went at it under the sun! We had a full house and quite a few games were played, I managed to grab some pics of the games and get a game in against Duane's in progress 'Cromwell' list. 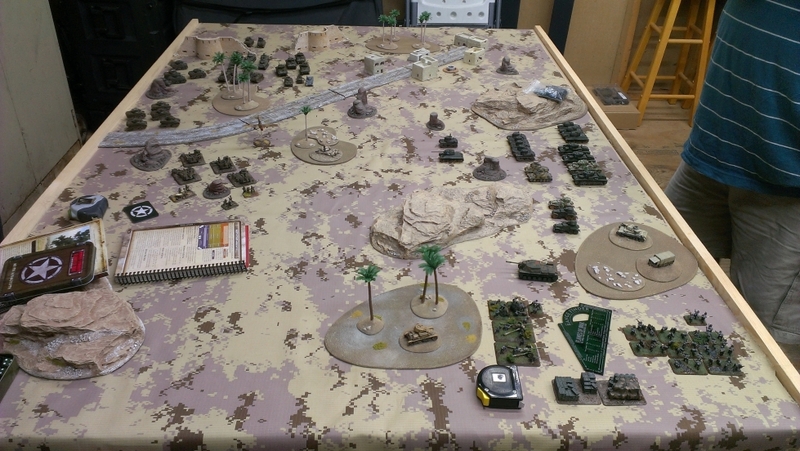 1500 points was the total we went with, this gave everyone over at the house a chance to play. It was an all out slug fest on the camo table with Chris and Marty fielding what must have been 25+ pieces of armor running around the table. Marty and Chris prepare their forces on the camo desert table. 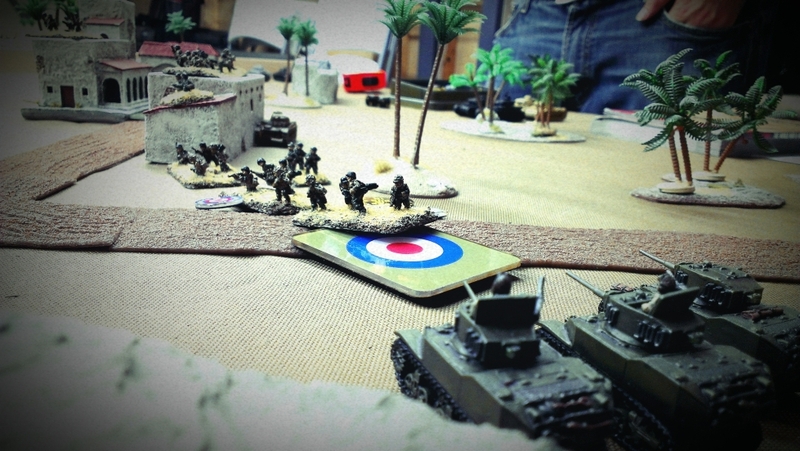 Duane points out to Tristan that Cromwell's are a 'viable' tank. 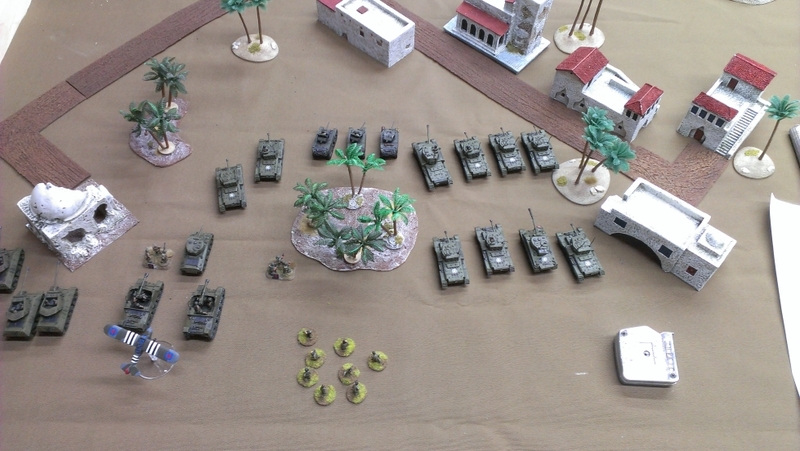 Tristan's forces prepare for battle, note the 'bailed out' figures. The night was fairly quick as we got two games in on one table, while Marty and Chris slugged it out for the whole two and a half hours. I was busy catching up and being a good host, so that means I was a terrible correspondent.....not really sure what either mission was and Duane was testing his list, so he pretty much had German's representing his British Cromwell recon list. Have no fear, his tanks are in the mail! I was able to score him a great deal on the Cromwell recon box for $140! They should be here sometime this week, although likely not in time for this weeks FnF. Deployments done, now time to fight it out! The game only lasted a few turns. The last push towards victory! After Cash (Tristan) had wiped poor Duane in double quick time, we re-set and I brought out my 1500 German list, Schwere Panzer Coy, a few Tigers, a few Panzer IV's equals total mayhem for the allies! 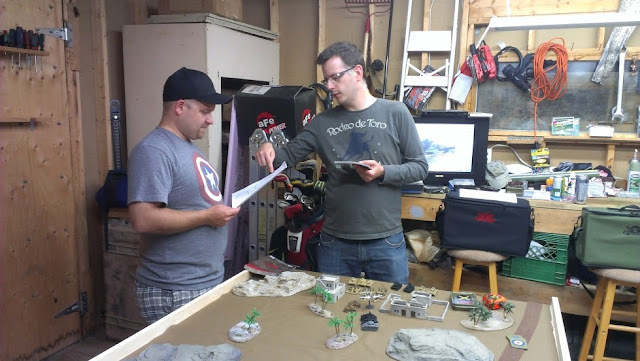 This did mean that Duane could now use Tristan's Cromwells and put together his list represented by actual models that match! 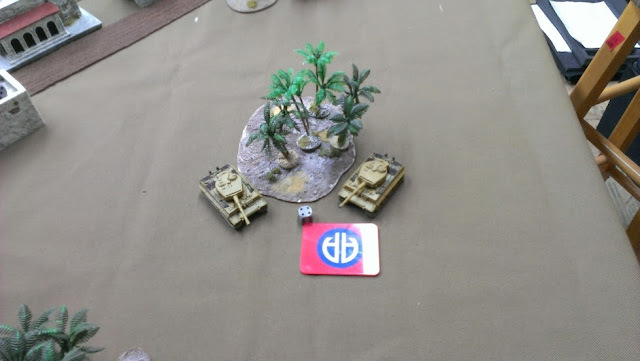 It was a fun game and I owed Duane a loss, he beat me really bad in our last meeting with his German's vs. my 82nd Glider Coy. 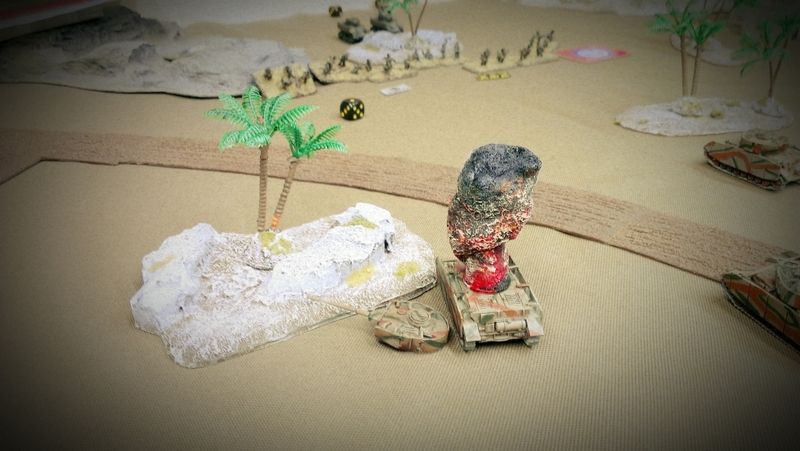 Duane's ambush pops a Panzer IV. My Company Commander's Tiger tries to keep the Brits on their heels! 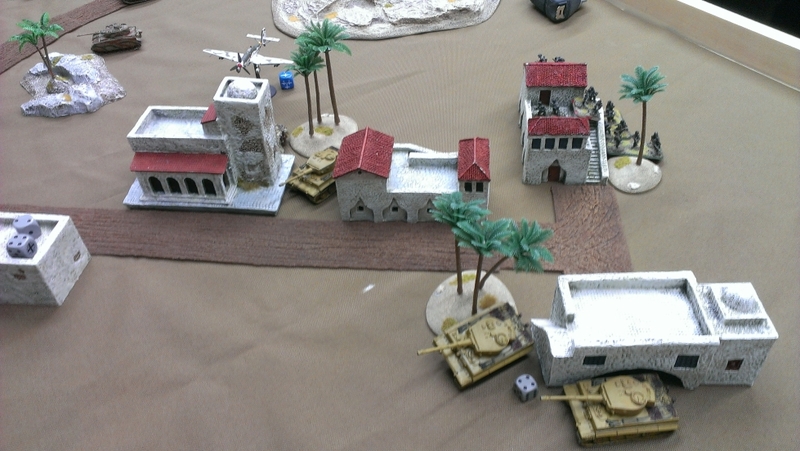 Tigers move into cover to avoid the constant Allied air threat! Can't move 'em off, can't kill them off....Germany takes this one! 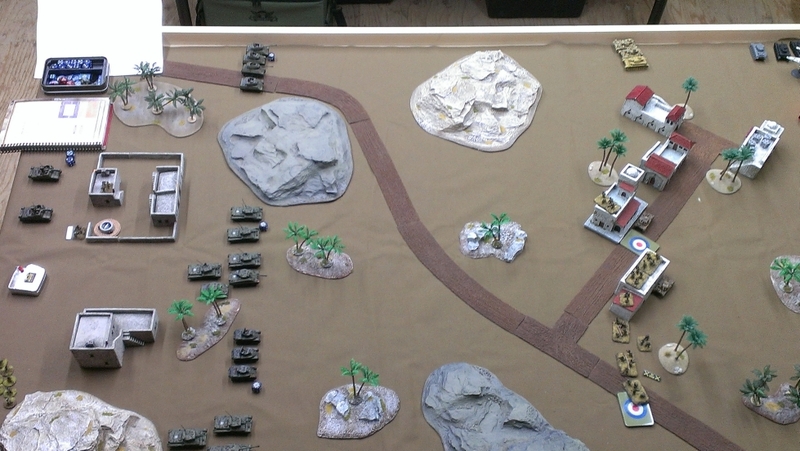 I pretty much used cover the whole time and punched holes in his defenses to gain and hold the objective for a turn to secure Kraut victory!! I took some pics of last week as well, the only nice thing that came out was Rob's Scots! The painting is coming along, and who is going to argue against a guy with a gun....wearing a kilt!? I'll be sure to get some pics of them posted shortly!